Robbie Casho, 29 of Chesapeake City, Maryland is an exception to the rule. While most watermen are aged with experience and time on the water Casho is just a few years in. “They all said ‘if you are still crabbing when you turn 30 you might as well stay’ and it looks like I am,” said Casho. Although he did not expect to be a waterman after graduating college, he has always had a connection to the water born into a family of tugboat captains. In 2008, he graduated from Williamson College in Media, PA where he studied Machine Tool Technology. The economy was not good after college due to the recession experienced from December of 2007 to June of 2009, according to the U.S. Bureau of Labor Statistics. So he decided to start working as a waterman fulltime while looking for something permanent. The summer after graduation he bought a boat and everything surprisingly fell into place. On most summer days Casho jumps up before the Sun to prepare his boat. He starts work around 5am collecting crab baskets and putting down trotlines. As the Sun wakes up he is already on the water baiting his line for the next day. Most days he spends up to twelve hours on the water with a radio, a cellphone and crabs. On occasion he brings along a friend, Diesel, his thirteen year old Chesapeake Bay Retriever. 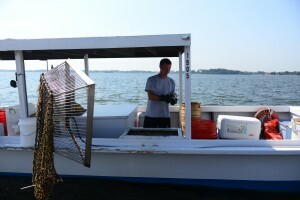 After crabbing season he naturally transitions to oystering to keep a steady income. Recently, his father who works as a tugboat captain has spent a few seasons working with him instead. Ever since steam engines the majority of his family has worked on boats and the waterfront in Maryland. Set apart from the rest, Casho is the first of his family to become a full-time waterman. Now he is teaching his father everything he knows about crabbing and oystering. While most of this generation is seen on Facebook, Twitter or Instagram, Casho is not entertained by either. When he is not working he can be found fishing or hunting ducks and deer with friends. He is happy being dedicated to the water because he enjoys it. “If I wasn’t doing this job full time I would be doing this as a hobby,” he said.